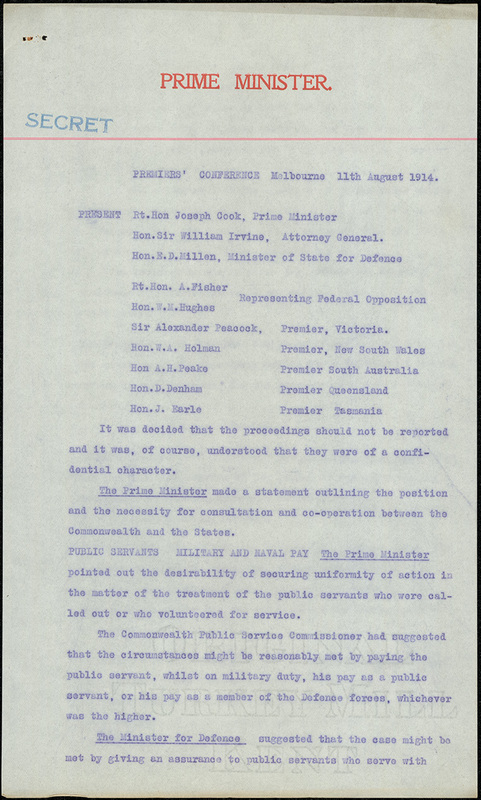 When men and women throughout New South Wales woke up on 5 August 1914 they found that Australia was at war with Germany. By the 12 August the enemy included Austria-Hungary and on 5 November the Ottoman Empire. 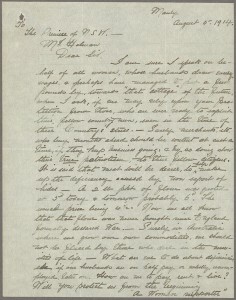 “I think I threw 2 or 3 somersaults when I finished reading the note for we were all more or less crazy at that time” . 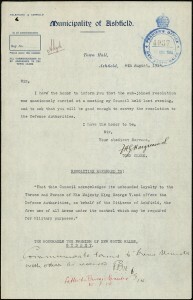 In 1914 Australian’s loyalty, along with pride in King and Country was demonstrated when enlistment began. 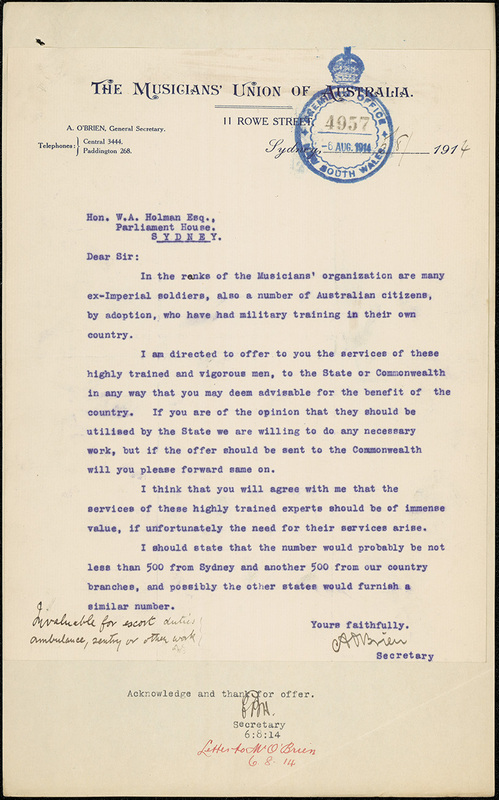 Between 11 and 20 August 1914 over 10,000 men enlisted in Sydney alone and by the end of the year over 50,000 men had enlisted. 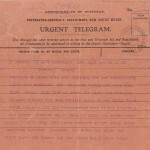 Businesses, unions, government departments and people around the state pledged their support for the war. 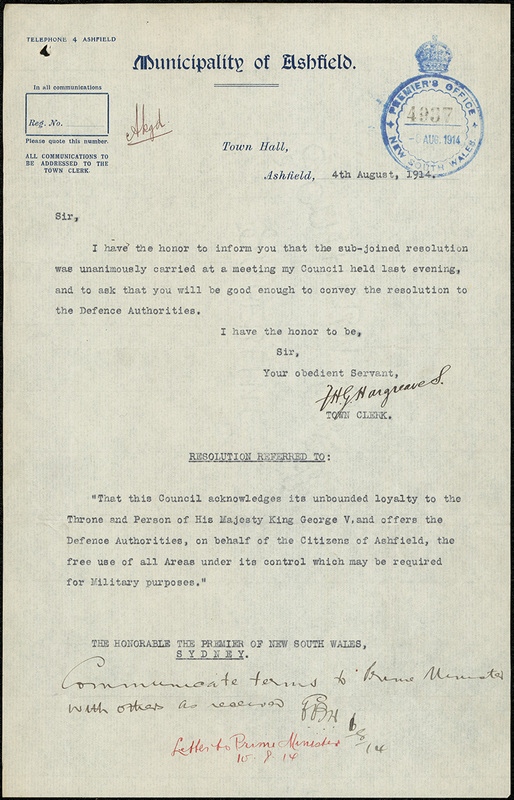 There are surviving letters from the likes of the Municipality of Ashfield acknowledging their loyalty to King George and giving “free use of all Areas under its control” to the State Government [Fig. 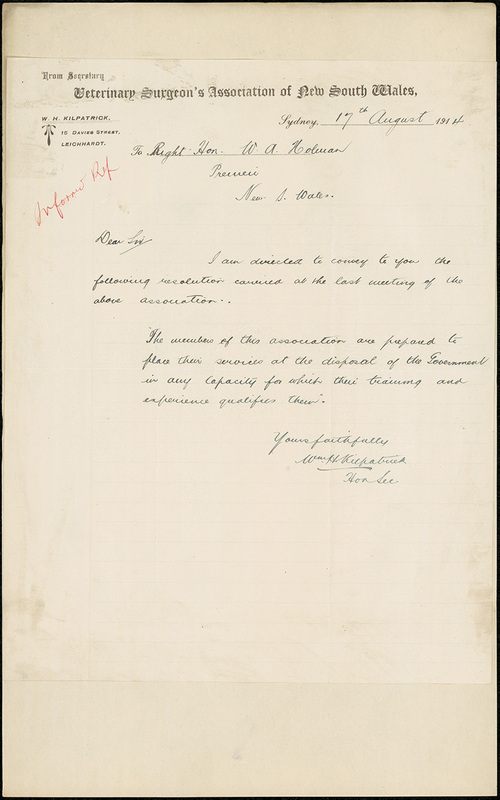 1]; the Musicians’ Union of NSW offered its members, which numbered about 1000 and included many ex-Imperial soldiers, to be utilized by the government [Fig. 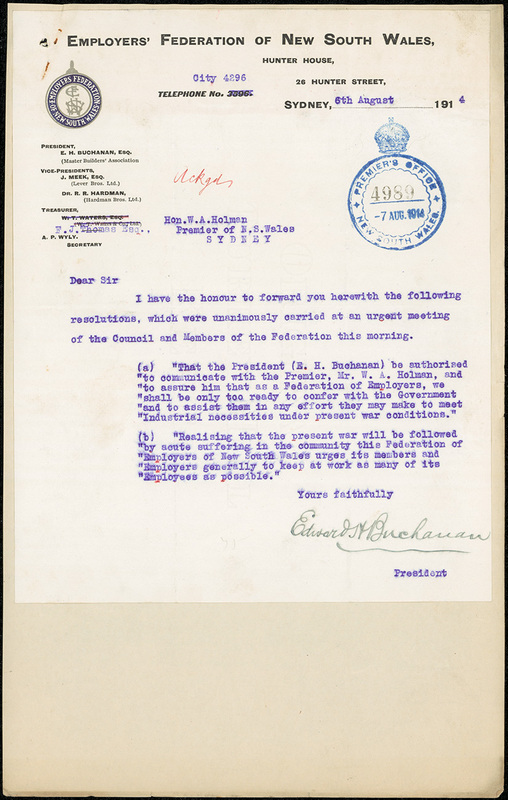 2]; the Employers’ Federation of NSW passed a resolution to help “meet Industrial necessities under present war conditions”[Fig. 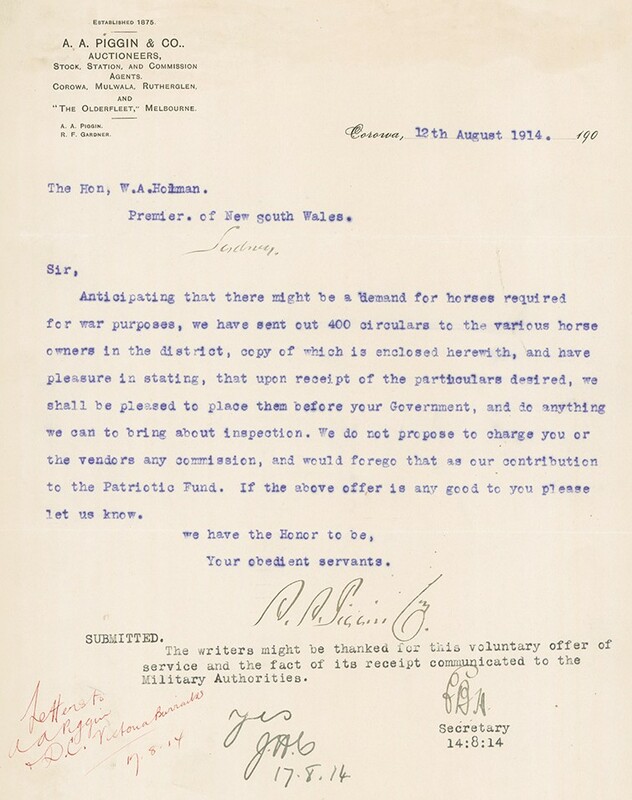 3]; and the Veterinary Surgeons’ Association of NSW resolved to “place their services at the disposal of the Government in any capacity” [Fig. 4]. 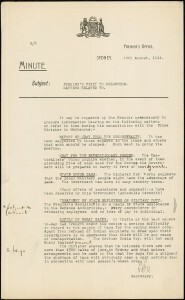 Premier Holman also received letters voicing concerns about the consequences of the war. 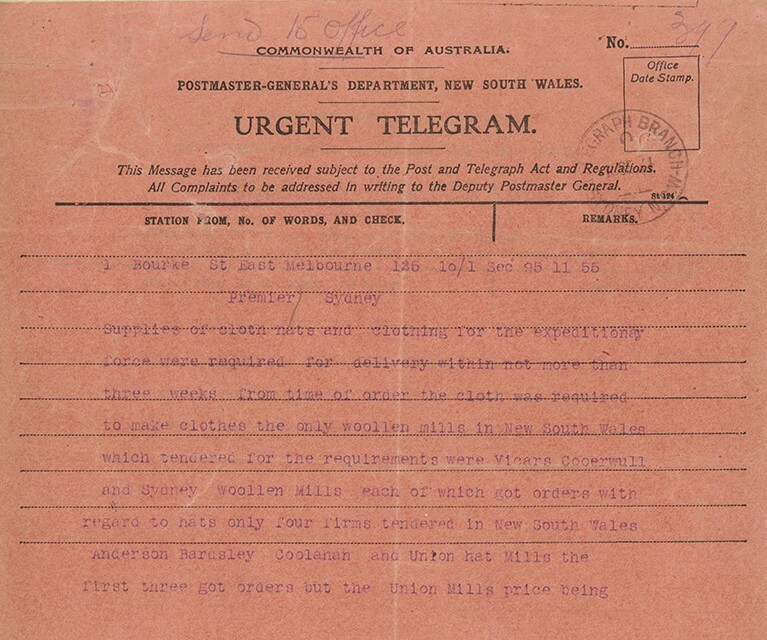 One letter from ‘A Woman Supporter’ in Manly raised the issue of the economic effects of the war [Fig. 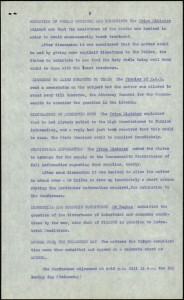 5]. She believed that exploitation was bound to occur and she was anxious about how her family was going to pay for rent and food when her husband was already on half pay. 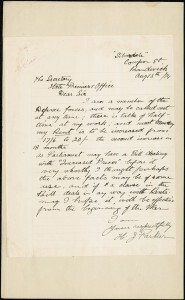 HJ Parker from Randwick was also apprehensive about money [Fig. 6]. 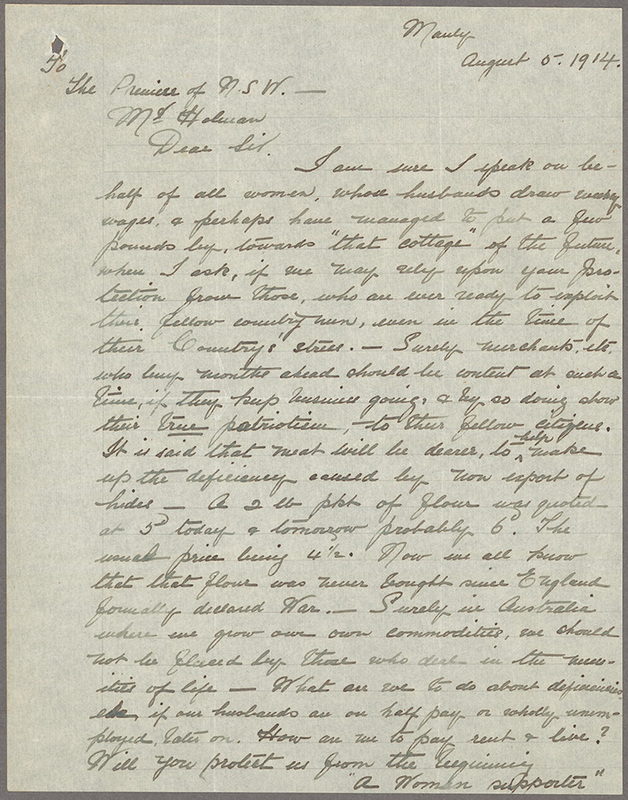 He wrote to the Premier in the hope that legislation might be passed to help to stop any increases in prices. 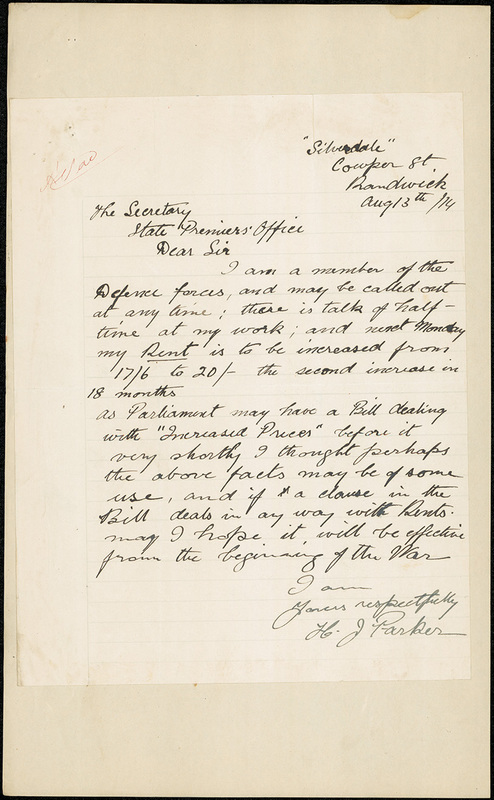 Parker, already on half pay at work and a member of the defence forces, was worried about rent increases. Other people, such as AA Piggin, showed a much more enterprising streak. 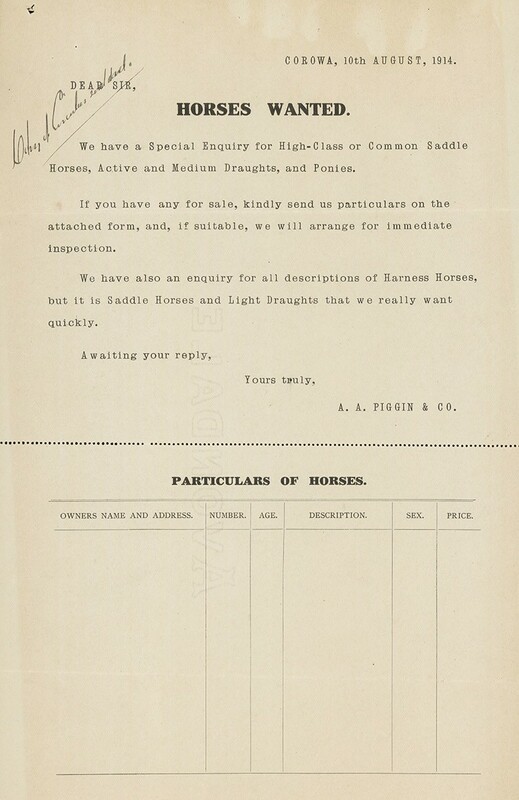 Piggin, an auctioneer based in Corowa, anticipated the demand for horses that would be required for military use [Fig. 7]. 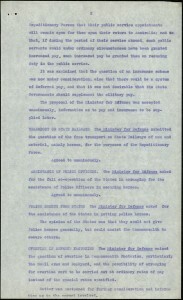 Piggin printed and distributed 400 circulars, which are dated 10 August 1914. He wanted to locate cob and light horses that would be suitable for military purposes [Fig. 8]. 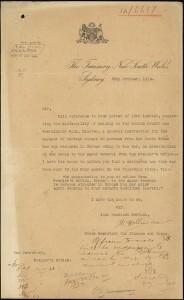 His efforts were passed onto the Commonwealth military authorities by the NSW government. 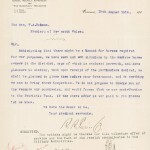 When war was declared the NSW government turned its vast resources into supporting the war effort in a variety of ways. Of paramount importance was to work in tandem with the Commonwealth government. 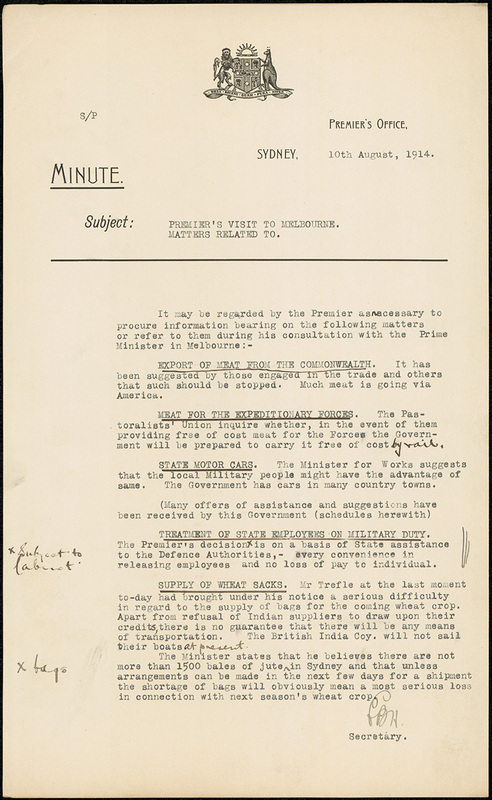 Just a week after war was declared the State Premiers from NSW, Victoria, Queensland, Tasmania and South Australia met with Prime Minister Cook in Melbourne for the Premiers’ Conference. The Conference was also attended by Andrew Fisher and Billy Hughes from the Opposition. 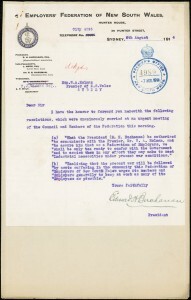 Holman went to the Premier’s Conference with an agenda. 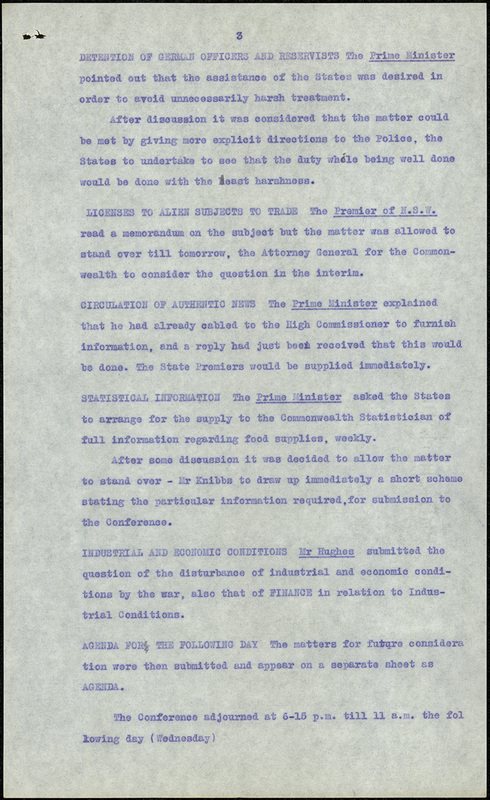 He wanted answers on issues that included trade (in particular wheat and meat), the treatment of State employees on military service and military authorities use of State cars [Fig. 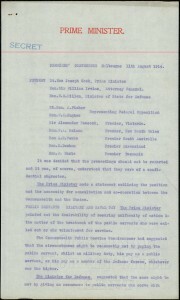 9]. 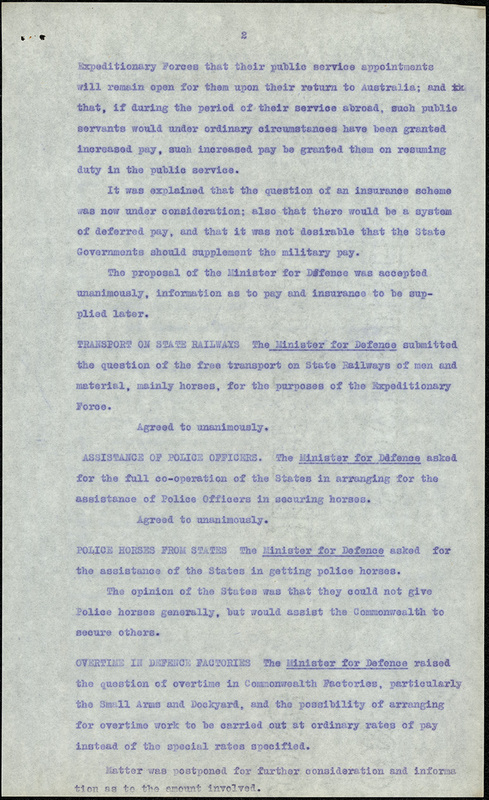 The ‘Secret’ minutes from the Premier’s Conference on 11 August 1914 include discussions on the treatment of Public Servants who volunteered and the difference in pay between military pay and their normal pay; the free transport of men, material and horses required for military purposes on State railways; the Prime Minister asked for State Police Officers to assist in securing horses; the humane detention of German officers; overtime in the Small Arms Factory and Dockyard and weekly reporting of food supplies in each State [Fig. 10-12]. Another important concern for Holman was keeping the NSW economy buoyant. Britain was an important trading partner for the state and it was vital to keep the route routes functioning as much as possible. 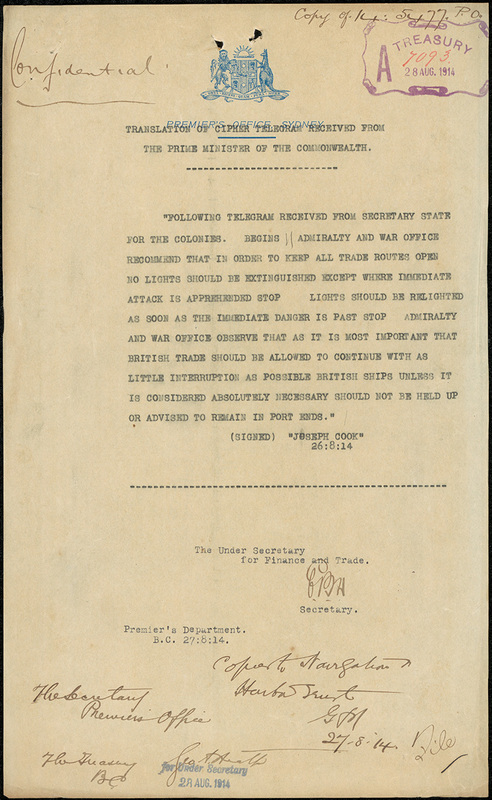 A telegram from the British War Office, dated 28 August 1914, advised of the necessity of keeping all the trade routes open and not extinguishing shipping lights unless an enemy attack was imminent [Fig. 13]. 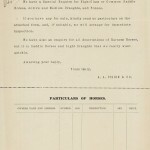 Ships, such as the Suevic, Borda, Ajana, Themistocles and Ayrshire, were requisitioned by the Department of Defence to transport troops on 15 October 1914 . The war also provided new opportunities for NSW companies, like Vickers Cooerwull and Sydney Woollen Mills, who had successful tenders to make troop uniforms while Anderson Bardsley in Coolnan had a successful tender for troop hats [Fig. 15]. 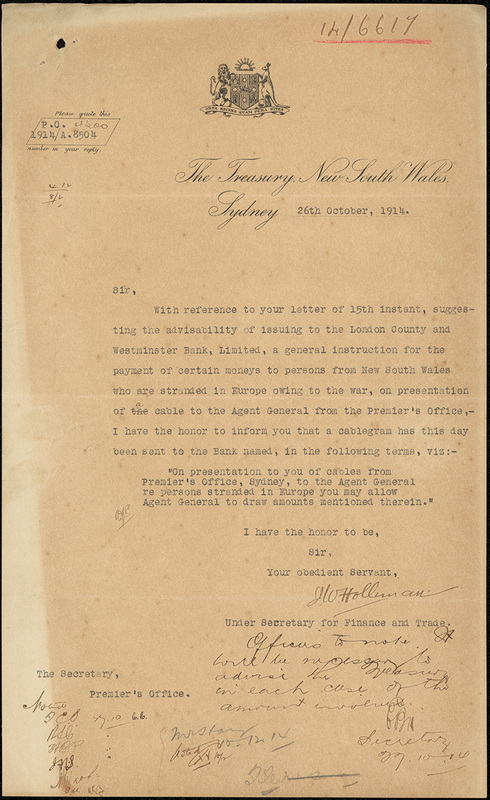 Another issue to resolve was how to help any people from NSW who found themselves “stranded in Europe owing to the war” [Fig. 14]. 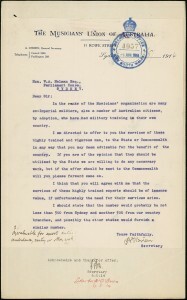 Permission was given to the NSW Agent General in London to pay “certain monies” to allow those stranded to return home. Caulfield, Michael, 2013, The unknown Anzacs: the real stories of our national legend, Sydney, Hachette, p.1. 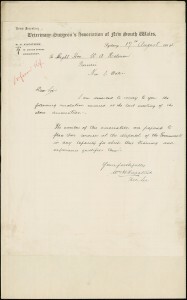 State Archives New South Wales: Premier’s Correspondence; NRS 12060 [9/4693] letter 14/6616, p.1.